I was 17 when I first saw Paris. I don’t remember what my first impression was. I remember arriving at Charles de Gaulle and thinking the airport signs were all yellow, which I wasn’t used to. Or maybe it was just that there were a lot of signs, all of which happened to be yellow. I don’t think that counts as a first impression of Paris. Of CDG, maybe. The first thing I distinctly remember was being in my room at Cité universitaire and thinking how bleak it was. I didn’t have much with me. It was to be a two-week trip, alone. Well, not alone. I was part of a group. We were the Allons en France, class of 2007. We had each been given a small red pouch upon arrival at our respective residences. Inside were a number of essential items. I probably spent the first hour of my time in Paris sorting through them, trying to figure out the significance of each. There was a pin. And probably a map. Yes, there was definitely a map. Of Paris. The next thing I remember was coming down to the hallway. There were a lot of announcement boards, with information on planned activities and allocated groups. There were about 150 of us – if I remember correctly – and we were to be chaperoned in smaller groups throughout our stay in the City of Lights. The next week or so whizzed by in a blurry of activities and new people. We did treasure hunt – or maybe that was with Sciences Po in 2011; I can’t remember. At one point we went into a majestic building for an official reception. I wore my Thai costume – peach-coloured and sparkling with (fake) gold glitters. Nothing fancy. To this day, I don’t know which building it was. Something tells me it was the Elysée. Actually, having just googled what it looks like, I’m pretty sure it was. The President wasn’t there. Though there was some high-ranking official present to greet us youngsters from around the world, fortunate enough to be whizzed through Paris for 15 days free of charge, courtesy of the French Republic. On one of our last days there, we were left to our own devices. Some of the people I had befriended were going off in groups, but I was determined to spend my day alone. Pretty determined. First trip (alone) to Europe, I wanted to prove – to myself more than anyone, I think – that I could manage on my own in Paris, if only for a day. My French wasn’t that good back then. And I was eager to test it out. I think it went fine. After half an hour in the Louvre to pay my respects to Venus and Mona Lisa, I was out. (Louvre art doesn’t interest me. I’m not a big museum person. I know.) So yes, having spent some time gazing at what I considered the immanquable of Lourvre, I allowed myself to make my way swiftly to what I considered – and still do – the heart of the Parisian art scene: Musée d’Orsay. I loved it. I spent more than three hours inside – wide-eyed and absorbed. I like impressionism, always have. It’s the only kind of painted art I can lose myself in. And d’Orsay is paradise for an impressionism lover. For the first time in my life, I walked until my legs throbbed. I walked until I couldn’t any longer. I would’ve stayed for longer if I could, but we were expected at Tour Montparnasse for a final evening together. Or maybe that was a different day. I’m not sure. I probably got lost that day. Yes in fact I think I did. I remember asking someone how to get to le métro le plus proche, and – having passed the ‘I-speak-French’ test – was swiftly directed to the nearest metro. Did I fall in love with Paris that day? Possibly. Though it might have been the highs of going off in a European city on my own. Maybe it was the arts, the museums. I don’t know. I don’t think it matters, really. 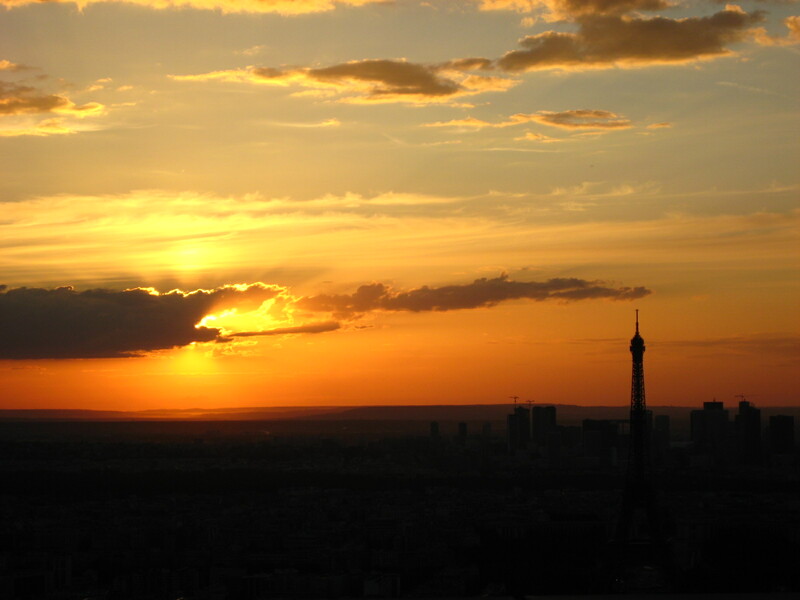 What I do remember, though, is the promise I made to myself on top of Tour Montparnasse, on our last night in Paris. We were having a farewell party on top of the tour. Back in the day, there was no grille. Not sure why or when they put them up. When I went back to Paris in 2011, it was already there. I’m coming back. No matter what I must do, I’m coming back. And came back I did. It took me 4 years, but came back I did.